More than half of 80 species subpopulations studied face increased vulnerability. 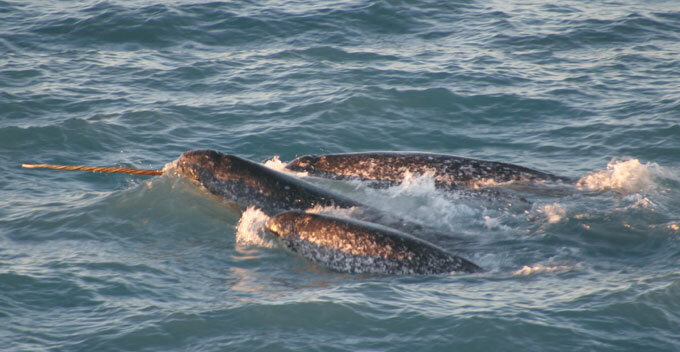 Narwhals found to be most vulnerable marine species. The high Arctic long has been seen as a vast, impassable span of ice accessed only by intrepid and daring explorers. But as more sea ice melts, the region is becoming more accessible, and travel by ship is now possible under certain conditions. As global temperatures warm and more water opens up, vessel traffic continues to rise, from shippers seeking shortened – and more profitable – transit routes to tourists looking for new bucket-list experiences. This year, a container ship brought cargo along the Northern Sea Route for the first time, and in 2016, and again in 2017, a luxury cruise ship with more than 1,000 passengers transited the Northwest Passage. The cruise ship company has since discontinued the route. Boom for Arctic shipping. But threat to marine mammals? Given the theoretical potential dollar value of increased Arctic shipping, few may be surprised that economic considerations will have a major influence in ongoing decisionmaking. Estimating the total value of that shipping involves making numerous estimates involving current knowns, unknowns, and unknowables. An analysis by Copenhagen Business School-Maritime says “Arctic liner shipping may become economically feasible around 2040.” Authors of that study note that an ice-free Arctic eventually could reduce some shipping distances by nearly 40 percent. But many factors influence the practicality of these routes, including the amount of ice lost, length of the ice-free season, geopolitical considerations, and potential operational costs and fees, including insurance and port fees. The cost to construct appropriately reinforced vessels is also an issue, as is the future cost of fuel. Among factors to be considered are fuel consumption characteristics of reinforced vessels and the lower speeds they will likely travel through still-icy waters. With scientists predicting an ice-free Arctic summer possible as soon as 2040, this uptick in vessel traffic – and the projected further increase in traffic – has marine biologists worried. University of Washington marine biologist Kristin Laidre and colleagues recently published a study in PNAS exploring the threat increased vessel traffic poses to Arctic marine mammals. “There was room for a broad pan-Arctic look at how that might affect these ice-associated or ice-obligated marine mammals that live up there because they really haven’t experienced this kind of human activity in their evolutionary history, so it’s going to be a pretty big change for them,” Laidre says. The team studied seven species – beluga whales, narwhals, bowhead whales, ringed seals, bearded seals, walruses, and polar bears – and examined 80 subpopulations of these animals to assess their vulnerability during the month of September. The researchers found that 42 of the 80 subpopulations they studied were “exposed to open-water vessel transits in the Arctic sea routes,” according to the paper, heightening concerns about potential conflicts. What makes month of September so important? The study focused on the month of September because that is the month with the sea ice minimum – and most open water – making it the ideal month for vessels to transit these routes. However, September is also critical for migration for many marine mammal species, including some whales. Laidre says also that many vessels will be most likely to transit the area in the early fall. “It’s the time when you basically have the highest probability of being able to get through some of these key waterways,” she says. Researchers are concerned the vessels will disturb the animals, including through acoustic disturbances. Ship strikes are another concern, especially for larger animals like bowhead whales. Pollution, such as oil spills, could also harm wildlife, though the study didn’t address that issue. These potential threats are heightened because ships and animals both must past through narrow passageways – what the scientists refer to as “bottlenecks” or “pinch points” – during these key times. “For the same reasons the ships have to pass through, that’s where the animals have to pass through,” Laidre says. “So we basically identified those as high-conflict areas where you would have a pretty high probability of vessels encountering these species at that time of year.” She and her research team found that animals are two to three times more vulnerable in areas with “geographic bottlenecks,” such as the Bering Strait and portions of the Canadian Arctic. Because many of the animals follow what the paper calls “genetically based migration routes,” it isn’t generally possible for species to alter their patterns in order to avoid conflict with ships. Of the seven species studied, narwhals – a species with a growing pop-culture following and colloquially called the “unicorns of the sea” – were found to be at most risk from the increased vessel traffic. These marine mammals have a relatively small geographic distribution, living high in the Arctic and near parts of Greenland. Stressful events can cause physiological distress in narwhals, including a sharp drop in heart rate – sometimes dropping below four beats per minute – further exacerbating the threat. Polar bears were found to be the least vulnerable to the impacts of vessel traffic in this particular study, but Laidre emphasizes that is due to the fact the bears are typically on land or on far-flung hunks of sea ice during the month of September. However, Laidre notes ships and icebreakers wouldn’t just transit the area during September, so polar bears could still be quite vulnerable to these threats when they are in the area during other times of year. Given her concerns, Laidre says she believes people need to work together to address the impending possibility of an ice-free Arctic. “We hope that as a global community we’ll do something and get together and control our emissions and use sustainable energy sources, but we’re on a path to an ice-free Arctic that’s going to mean substantial changes, of course, globally but substantial changes for these species,” Laidre says. Kristen Pope is a Wyoming-based freelance writer who frequently covers science and conservation-related topics.